Guido Cavalcanti (c. 1255 – 1300) was an Italian poet who was one of the founding members of one of the most important movements in all of medieval poetry, the Dolce Stil Novo ("The Sweet New Style") which in the eyes of many scholars would mark the transition from the classical poetry of the medieval world to the new emerging styles of what would become the Renaissance. Dante was a member of the same movement and a personal friend of Cavalcanti, while such luminaries as Boccaccio and Petrarch would refer to Cavalcanti as an instigator and an inspiration. In some respects, although Cavalcanti produced a small body of work and achieved much less fame than Dante, he was nonetheless the most important member of Dolce Stil Novo; Dante himself viewed Cavalcanti as a role-model, and many of the other poets belonging to the movement would pay their respects to Cavalcanti's genius. Cavalcanti chose to write in the vernacular, or "vulgar" Italian, instead of the traditional Latin, making him a key participant in one of a number of important turning points in the breakdown of Medieval culture and the rise of modernity initiated by the Renaissance. Cavalcanti's ideas are associated with atheism via negativa, that is, not so much because he promoted it, but because he did not promote the Christian worldview of his time. In this way, too, he was one of the early pioneers of the humanism that would come to characterize the Renaissance and the rise of modernity in the succeeding centuries. Despite his relative obscurity, Cavalcanti continues to re-emerge with each new generation of writers as a true "poet's poet." From the Romantics such as John Keats, to Dante Gabriel Rossetti and the Victorians, onward to Ezra Pound and the moderns, countless poets living centuries after Cavalcanti's death still find in him a poetry unmatched in its sonorous beauty and earthly realness. Cavalcanti was the least abstract and the most technically accomplished of the poets of his time, and his supreme mastery of form continues to inspire poets to this very day. Information about Cavalcanti's life remains scant. He left only 50 poems, most of them brief, and records of his life are only of the barest kind. It is known that he was a friend and colleague of Dante. 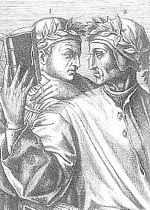 Dante considered him a teacher, and they both studied under the Latin scholar Brunetto Latini as young men. Cavalcanti was born in Florence and was the son of the Guelph, Cavalcante de' Cavalcanti, whom Dante condemns to torment in The Inferno. As part of a political reconciliation between the Black and White Guelphs, Guido married Beatrice, the daughter of Ghibelline party leader Farinata degli Uberti. In June of 1300, the Florentines grew tired of the constant brawling between the Ghibellines and the Guelphs, exiling the leaders of both factions, Cavalcanti among them. He was sent to Sarzana, but after only a few months he decided to try to return to Florence. He died of malaria in August of the same year, on his journey home. Although most Tuscans are overwhelmed by their bad language, we think that someone has experimented the excellence of high vernacular, namely Cavalcanti, Lapo and another [i.e: Dante himself], all from Florence, and Cino da Pistoia. Which love is killing with his sighs. It threw an arrow into my side. His pessimistic views are perhaps influenced by atheism. There is no firm evidence that Cavalcanti was an atheist other than spurious rumor, but it is known that he was an adherent to the theories of Averroes, according to which a man’s soul is material, and dies with the body. In Cavalcanti’s case, love may lead to death when a man’s soul, being corporeal, is mortally wounded by the disdain of the woman he loves. In the Dolce Stil Novo, as in troubadour and Sicilian poetry, it is not the woman that falls in love, but the other way round: The first appearance of the madonna strikes the poet’s heart like lightning, and while she is generally unaware of what she's done, the man finds himself wracked by passion and unable to escape from his desires. With its genuine interest in the psychological phenomenon of love, the Dolce Stil Novo, and Cavalcanti at the foremost, are in fact remarkably nearer to Petrarch and the modern romantic sensibility than they are to other medieval styles of poetry. The possibility of probing its effects. In short, according to this poem, the sensitive soul is located in the brain, but does not produce love-feelings unless the eyes meet those of a particular woman who has exclusive affinity to that soul. This complies with Aristotle's theory of cause and effect, whereby no effect can proceed from an object if the object has not the potential to accomplish it. When a woman's look meet the eyes of a man, the potential for love grows into passion, a spirit or fluid that possesses all his faculties. The merit of all this philosophizing in Cavalcanti's verse is its ability to describe what goes through the poet’s mind in a very detailed, personal manner, creating sensuous, autobiographic poetry. This is revolutionary compared to the rhetoric and academic exercise of the Sicilian and Neo-Sicilian Schools that had preceded the Dolce Stil Novo and a sign of the changes that were to take place in Western poetry. Cavalcanti is widely regarded as the first major poet of Italian literature: Dante calls him a "mentor," and all of Dante's contemporaries treated Cavalcanti with great reverence and respect. In the Commedia Dante says that "…ha tolto l'uno a l'altro Guido / la gloria de la lingua" (Purgatory XI, 97-8): "The verse of the latter, younger Guido (Cavalcanti) has surpassed that of the former, Guido (Guinizzelli)." His meter and his language deeply inspired Dante's work, though Dante disagreed with Cavalcanti's materialistic views on love, responding by creating an entirely new spiritual ideal of romance, as personified by Beatrice, whose soul becomes Dante's guide through Paradise. Cavalcanti's controversial personality and beliefs attracted the interest of Boccaccio, who made him one of the most famous heretical characters in his Decameron, helping popularize beliefs about his atheism. Cavalcanti was studied with more serious interest during the Renaissance by such scholars as Luigi Pulci and Pico della Mirandola. Because he was so central to the development of Dante's style, Cavalcanti's influence has helped to change the very shape of the Italian language which, after Dante and Cavalcanti, would become modeled on the language used in their poetry. Cavalcanti was to become a strong influence on a number of writers associated with the development of Modernist poetry. This influence can be traced back to the appearance, in 1861, of Dante Gabriel Rossetti's The Early Italian Poets, which featured translations of works by both Cavalcanti and Dante. The young Ezra Pound admired Rossetti and knew his Italian translations well, quoting extensively from them in his 1910 book The Spirit of Romance. In 1912, Pound published his own translations under the title The Sonnets and Ballate of Guido Cavalcanti, and in 1936, he edited the Italian poet's works as Rime. A reworked translation of Donna me prega formed the bulk of Canto XXXVI in Pound's long poem The Cantos. Pound's main focus was on Cavalcanti's philosophy of love and light, which he viewed as a continuing expression of a pagan, neo-platonic tradition stretching back through the troubadours and early medieval Latin lyrics to the world of pre-Christianity. Pound also composed a three-act opera titled Cavalcanti at the request of Archie Harding, a producer at the BBC. Though never performed in his lifetime, excerpts are available on compact disc. In Pound's modernist manifesto, The ABC of Reading, Cavalcanti was put forward as one of the finest examples of a master poet. Throughout the short book, which outlines Pound's theories of poetics and goes on to implore the reader to consume a vast list of books (all, of course, approved by Pound), Cavalcanti receives Pound's highest recommendation, and in Pound's eyes is only ranked beneath the troubadour Arnaut Daniel for the title of the greatest poet to have ever lived. Pound in particular admired Cavalcanti's absolute mastery of poetic form, as well as his unsentimental views of love, believing them to be far more rational and ultimately far more interesting than the high-flung spirituality of Dante and Petrarch, which has nonetheless remained so popular. AA.VV., Antologia della poesia italiana, ed C.Segre and C. Ossola. Torino: Einaudi, 1999. Dante, Divina Commedia, ed. Natalino Sapegno. Firenze: La nuova italia, 1982. Dante, Vita Nuova. Milano: Garzanti, 1982. Giudice, A. and G. Bruni. Problemi e scrittori della letteratura italiana. Torino: Paravia, 1973. From The Sonnets and Ballate of Guido Cavalcanti. This page was last modified on 18 July 2017, at 18:58.